Keep yourself updated with the latest developments at Astrum. Get the latest press releases and read what’s kept us in the news. ‘Ache din’, the winning narrative that still reverberates in the ears of Indians and is a major throwback to the historic 2014 Parliamentary elections, was developed from the insights generated by the extensive research that was undertaken by the BJP to understand the ‘hearts and minds’ of the voters. Mr. Ashwani Singla, Founding Managing Partner, Astrum and formerly the Asia MD of Penn Schoen Berland led the polling team that generated the insights. The deep understanding of the voters was extensively used in the 360-degree communication campaign to persuade the voters that the “Modi Sarkar” would be the best choice to lead the nation. 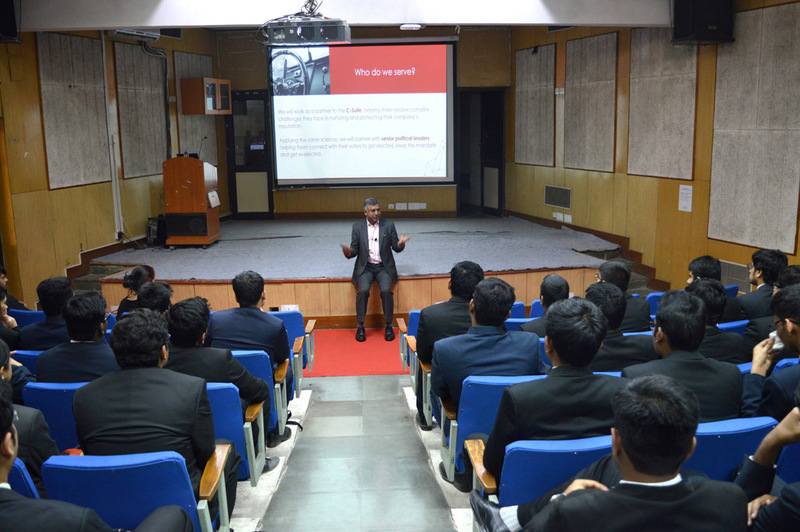 Department of Management Studies, IIT Delhi organizes its flagship Business Leader Lecture series and Mr. Singla was of one our eminent guests as a part of this series. He was with us to deliver his viewpoints on the topic “Using Science to Persuade” and interacted with the students. Explaining persuasion, he says, “persuasion is consent through an informed choice. Not coercion.” He added, “elections are a great example of how a large population is persuaded to choose. What is popularly known as molding public opinion.” Explaining goodwill Mr. Singla said, “goodwill is generated when people are better informed, feel they have a stake in the future and participate in making a choice freely. A recipe for goodwill or good reputation.” He explained to his audience how Astrum is pioneering the use of science and creativity to develop reputation strategies for its clients. Elaborating on the skills needed, he explained that Critical Thinking, Collaboration, Creativity and Communication are crucial to succeed. Using the lessons learnt from the 2014 election campaign, he explained the application of science to generate insights to segment, target and position companies and candidates. He used Astrum’s proprietary segmentation framework to its application. He explained the way such insights are used to help companies/candidates ‘stand apart’ from competitors and rounded it off with a demonstration of that would be converted into a simple and clear message. The floor was then opened for questions from the inquisitive audience who wanted to know more about topic. Our erudite guest answered all the queries of students. DMS, IIT Delhi expresses its heartfelt gratitude to Mr. Ashwani Singla, for sparing his valuable time and delivering an informative lecture to the students. We look forward to having him on campus again. Join the conversation and share your views with us, nothing would please us more than to have you share your point of view. The wisdom of veterans and the dynamism of gennext; the scientific mind and the creative soul; the copybook and the innovator – our leadership team has the right mix of it all.